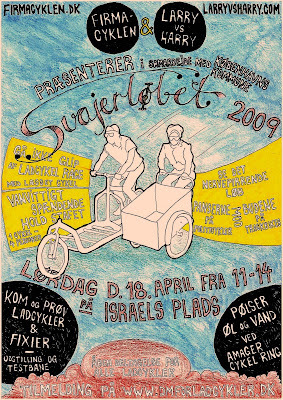 Here's the poster for the National Cargo Bike Championships, which is a rather fancy, modern name for an almost century-old competition - Svajerløbet. 'Svajerne' are the granddaddies of bike messengers. They rode around the city with massive cargo bikes, delivering goods. They were known for being loud and boisterous and they weren't afraid of foul language and whistling at attractive women. There were several competitions each year where they raced their cumbersome cargo bikes around tracks and competed in many other disciplines. This year sees a bit of a revival the Danish Championships for Cargo Bikes, to be held on Israels Plads on April 18th, 2009. It's sponsored in part by the City of Copenhagen, Larry vs Harry cargo bikes and Firmacyklen.dk. Should be a blast. Apart from enjoying sausages and beer, you can try out different cargo bikes and fixies. The main attractions are the cargo bike race with fully loaded bikes as well as the Police on police bikes vs. the Bike Messengers on track bikes. Not to mention the team relay competition with four riders and one bike. The website isn't up and running yet, apart from a welcome page, but it'll kick in soon. You can sign up for email news.